Our indoor camp has no rain outs, excessive heat (air conditioned) or bugs! Click on any of the dates above to Register! TSC offers before and after care (8am until 6pm). You must contact TSC at 978-649-9393 to sign up for the before/after care. 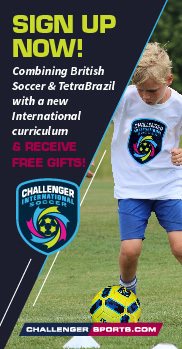 Challenger Sports began as British Soccer Camps in 1985 with 200 children; in 2016 we coached 127,000 children in 2400 camps nationwide. Challenger has been runningcamps at TSC since 2006 and we are proud to have been selected to provide a venue for their camps year after year.